Hi I am Carolina. I am a Chef by heart who learn to cook from my grandma and share my heritage trough food and I dream one day had the opportunity to compete in Food Network! I am Latina and Latinos we do not give up!!! Because my native language and living in American some times my recipes are in Spanglish. I love to share and teach people how to cook and I has been developed recipes in my cooking blog step by step. I do updated and completed them between times. I love spices and try new recipes from other cultures.My favorites movies are romantic and funny comedies and movies about food. Ones of my favorites: The Chef (2014), Le Chef, Julie & Julia , Babette's Feast, Like Water for Chocolate, Chocolat, Mostly Martha, No Reservations, Ratatouille, Tortilla Soup and Woman on Top. I just love the New Movie the Chef and I only has watched the trailer. Cannot wait until actually watch the movie!! 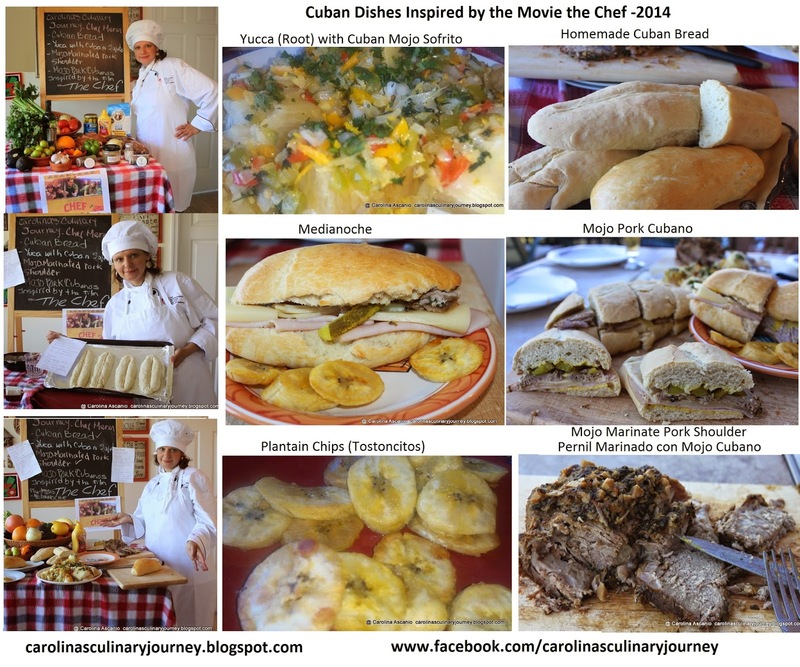 The Movie the Chef (2014) directed by Jon Favreau has inspired me to prepared these Cubans dishes. Thanks for be my inspiration to prepare these delicious Cuban recipes…Enjoy it my recipes and cooking videos uploaded in you tube! On Saturday Morning (June 24) when I wake I told to my husband that will be awesome if I made the dishes form the movie the Chef (I do not if anyone else has done a homemade video about dishes from the Chef). I believe in my talent and in the food that I prepare and people love it! Let tell you my food is delicious and whoever tried my dishes they love and are open to try dishes from others counties made in the original way- that is also why I love spices : because I can recreate dishes from other countries and I love to share and people enjoy it and asked me for recipes or cooking tips or If I made a new special dishes I called my friend close buy to try some. I went to our local grocery Kroger and buy it anything that I will need to prepare the dishes. By the way I have not yet watched the movie. Is not play yet where I live in Beavercreek Oh. I only watch the trailer and read some reviews from the internet but since I am from Venezuela some of our dishes are similar. We eat a lot of plantain, rice, beans, we love roasted pork (Pernil) with sandwiched and Arepa and the Venezuelan Arroz con Pollo is very famous.I can make ll these dishes and I know that they will be very delicious. My son who is 8 years old did the quality control- He asked for more pork!!! After I planned all the menu that I want to prepare and since in one of the pictures here is a blackboard outside the food truck with Cubanos, Medianoche and Arroz con Pollo I decide that was very cool to put for my video a sign with the dishes that I was planning to prepare in my cooking videos. My husband and my daughter help me with the videos. We did an introductory video in English and Spanish and since I am Latin and we love to dance I add some music in the background – There was a party in my kitchen while I was cooking and I love the music from the movie. Always there are music in my house and by the way I do have a house policy: who come to my house eat and dance will come back and you always live my house with a new recipe! And we Latinos love to dance while we cook! The Initial Menu that I planned ahead to do cooking videos inspired by the movie were: Homemade Cuban Bread,Yucca (Root) with Cuban Mojo Sofrito, Mojo Marinate Pork Shoulder (Pernil) and of course Mojo Pork Cubano ( Sándwich cubano de Pernil). The preparation start on Saturday afternoon and on Sunday I decide to add and Plantain Chips (Tostoncitos) and made some Medianoche too!. I cook for a lot of hours and the hardest is to make the videos- I am not a video expert I just use Movie maker and it takes times to put the clips together... and I enjoy it to do the cooking videos . Please enjoy mi videos and recipes.Thanks !!! A chef by heart and hearth! Special Video made for a Food Network Contest: Sofrito The Sazon of the Latin Cuisine. (Sofrito is also part of the Cuban Cuisine)!!!. I invited you try my Sofrito. just saw this movie and started searching for the dishes. Stumbled across your blog and loved it. Makes me want to watch the movie again and cook something. Hope you have watched the movie by now !! PS:- i got so inspired from the movie, that i made a vegetable grilled sandwich..!! Dear Shweta I am so glad that you find my blog. I loved the movie very much too. Actually last night I was watching The Chef with my husband and today I read your comment- what a great coincidence!!! Please share in my Facebook page Chef Carolina Ascanio your picture if you like. I did the cooking videos too!!! .If you make any of my recipes let me know!! If you need any Latin recipe I will be gland to help you.. Have a wonderful day!!! hi Carolina, thanks for sharing this blog. i was inspired by the Chef film as well, i have watched twice. i hope to learn more about Latina/Cuba/Mexican food, it looks really appealing. unfortunately, its hard for us to taste all this in asian, the country i m living, Cambodia. i hope one day i can start the food truck business as well, not just to make profit, but to share the passion to everyone. Thank you so much Henry. The Chef is a great movie. In my blog I share so many recipes that you can try out and let me know how do you like. Hispanic Food is very delicious. Also you can adapt the recipes using local products inn your country.